The organic vanilla has been ground into a powder from organically grown, whole vanilla beans. The vanilla contains vanillin (the compound responsible for vanillas aromatic smell and taste) which is a powerful antioxidant. It has also been shown to help reduce free radicals in the skin and strengthen your skin against dryness which is why it is used in cosmetic products. Our Vanilla beans have over 2% vanillin content. Vanilla also helps to decrease appetite and calm a queasy stomach as the aroma triggers the releases of serotonin making you feel calm, happy and satisfied! It's the ideal alternative to artificial flavours. A 30g pack can flavour up to 3kg of most of our Protein Powders, however if you want to treat yourself use 60g for 3kg of protein powder. And if you want it to taste sweet, dont forget to add some Organic Sweetener. 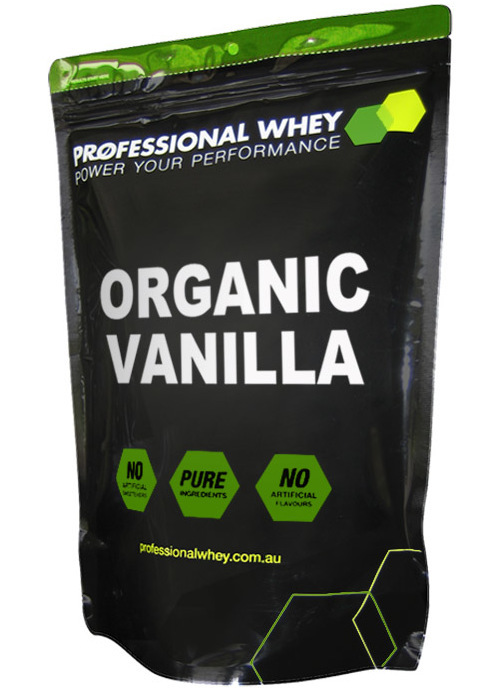 Add 0.5g to 1g of Organic Vanilla Powder to a protein shake, yoghurt or your favourite recipe. Love the vanilla powder uses it daily in my smoothies. Excellent to use in baking and dessert,gives flavour to products that you make that are sugar free. It is said to improve immunity and curb cravings as vanilla releases serotonin. I have never had any vanilla product that tastes as good as this. The aroma is amazing. I now use it in all of my cakes and energy bars as well as my shakes. A winner. Love this stuff. I got it to add to my Protein shakes, but I seem to be adding it to all sorts of things. My mum who has been cooking cakes for 50 plus years has taken to it and now adds it in place of vanilla beans and essence Easy to use and tastes fantastic. Amazing taste, very fragrant and full of antioxidants. I add it to smoothies, along with frozen berries. I definitely recommend this product. The freshest Vanilla Powder available but that’s my opinion. Since trying this product I now use it in almost everything that requires a sweet Vanilla flavour and even things that don’t... This product offers an awesome lift to shakes, healthy baking and even protein infused ice-cream, it’s a real treat. 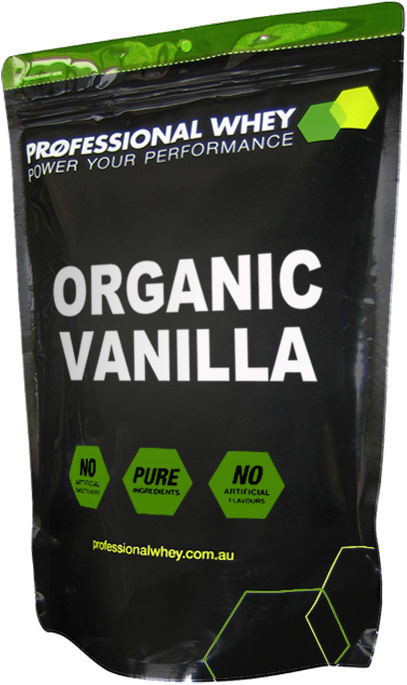 This Vanilla Powder is truly another top shelf product from Professional Whey not to be matched. I've used this product in so many ways and each time I do, I feel blessed. It goes in my protein shakes, my chocolates and panna cotta. The panna cotta had an interesting fleck through it. At first I was mortified, panna cotta should be white, particularly if it is "White chocolate Panna Cotta." But the guests at the wedding loved it and asked for the recipe! Absolutely love this!. Dissolves well and isn't too sweet. Adds a subtle but noticable vanilla flavour. Highly recommend! Best real vanilla and highly versatile! This vanilla (and the PW organic cinnamon) is now amongst of my kitchen staples. I use it in so many things, from protein powder to smoothies, to protein balls, to adding to high protein greek yoghurt to give it a beautiful rich vanilla flavour that would rival any pre-packaged main stream brand. Works as well in cooked recipes as much as raw. Just delicious. Highly recommended. Love the taste, will add it to anything. This pure organic ground vanilla bean powder is the best. Apart from the almond milk I add to the plain Whey Protein powder ta teaspoon of this vanilla powder is all I add and it has such a pleasant sweetness. I love the small black vanilla specks that you see through the liquid. This is the best vanilla I have ever been able to purchase and it!s organic what a bonus. My second favorite flavor of the lot. The organic vanilla powder has a great flavor and dissolves very well. I do not use it as much now because i love the organic cacao powder but for anyone who is a fan of vanilla it is definitely the the best product to get. I'm on a diet that cuts out all grains or dairy... that makes it hard to find anything to mask the taste of my post workout IBCAA and glutamine, but the organic vanilla powder makes it bearable! If I could add some sugar I recon it would be a go! Definitely worth a try if you want to add some real vanilla flavour to your shakes. If you follow a clean diet like me - you're probably eating Greek yoghurt and low fat cottage cheese. Yuk! But with a tiny bit of stevia extract they are very palitable - without the insulin spike of sugar. Saved me from gagging numerous times! Great with cacao or vanilla. Why torture yourself? Prowhey really stick with the organic way of life. Don't expect some white suggary powder, this is straight ground vanilla bean. Has a nice flavour and is great to add to unflavoured shakes. For cold drinks brew it ! I like to brew this like a tea infusion for use in cold soymilk drinks. In quantity this may be frozen and a little used each time. It is far better quality than the supermarket bottles and jars as it doesn't have added sugar and alcohol, just the real vanilla and in bulk ! Awesome product. Use it in so many things, from shakes, to homemade ice-cream. It makes it cost effective and easy to include real vanilla into recipes. Very potent, and definitely better tasting than the liquid essence you find in supermarkets. I measured a teaspoon as 2g, rather than 3g - but that's just me. I've looked all over the place, and I still haven't found a better online source of organic vanilla powder. I like the flavour and it is easy to use. Will buy again. Great flavour, get more flavour from the powder than with the paste or liquid. Great for sugar free cooking. Love the taste of real vanilla , will definitely buy again !! Our Organic Vanilla Powder is the perfect flavour to add to shakes, yoghurts & cooking. The organic vanilla has been ground into a powder from organically grown, whole vanilla beans. The vanilla contains vanillin (the compound responsible for vanillas aromatic smell and taste) which is a powerful antioxidant that helps reduce the risk of breast cancer. It has also been shown to help neutralise free radicals in the skin and strengthen your skin against dryness which is why it is used in cosmetic products. Our Vanilla beans have over 2% vanillin content. Vanilla also helps to decrease appetite and calm a queasy stomach as the aroma triggers the releases of serotonin making you feel calm, happy and satisfied! Vanilla has also been used medicinally for congestions, coughing, fever and other illnesses. A 30g pack can flavour up to 3kg of protein powder, however if you want to treat yourself use 60g for 3kg of protein powder. And if you want it to taste sweet, don’t forget to add a natural sweetener. One gram of this powder is definitely enough to flavour a 30g protein shake, and it's difficult to find organic vanilla powder in these quantities. Beats liquid vanilla esence in flavour and price. Excellent for Shakes and Bakes! This little package packs a ton of flavor. I used it in my shakes, at first. Then I experimented by adding the vanilla into homemade ice cream, hot drinks, and baked goods. It has not disappointed me yet! Pretty good flavour but not as potent as I thought it would be. I'm happy with it b/c it is a clean form of flavouring though. At first I thought I was ripped off because the packet was so small. But then I used it and Wow! !It is actually about a 1/3 of a cup of the seeds and resin from the vanilla bean. And anyone will tell you that is the best vanilla you can buy. Use it in anything you like. It is super great value if you have ever tried to buy a vanilla bean one at a time . I will be buying this product forever. I prefer chocolate in my protein shakes but I use this vanilla powder in everything else I make from my home made muesli to cakes and it's fantastic in home made custard (the proper stuff from scratch). I use this not just in my protein shakes, but also in recipes. It has a stronger, better vanilla flavour than the extract. It also provides value for money, as a little goes a long way. I cook a lot - from home baked wonders to 10 course degustations - you name it. This is one of my most favourite ingredients of all - easy, no mess, no waste and incredible flavour. I've switched from vanilla extracts and beans to soleyl using this powder for it's ease, quality, taste and convenience. This Vanilla is the real deal great Vanilla aroma and taste. Come in sachets for freshness and shelf life perfect for any Recipe Needing that real Vanilla taste ! I bought this organic vanilla to add some flavour to my 3 equal part protein mix of Micellar Casein MPI, Egg White Protein and WPI. I also sometimes add some Stevia Extract for some extra sweetness. After mixing it looks quite strange (due to the fact that it is quite simply ground beans and hasn't been tampered with in any other way) but I found it tasted really good.